MEAN Axle Bending Whelstand Performed By The Always EPIC Dave VerSchave! Dave VerSchave and his beautiful 496ci street legal ’55 Chevy “Orange Krate” Gasser tok on the strip and impresed at the Friday night Test N Tune Event. Aside from gracing numerous magazines, promotional ads and winning awards everywhere he goes, Dave is not afraid to drive or drag race this award winning showcar! On this night, Dave was out to pull some wheelstands after swapping rearend gears recently. Dave did not disappoint the fans and he slammed the gears bringing the ’55 skyward on two passes before bending the front axle and wowing everyone in attendance! To check it all out click the video below! 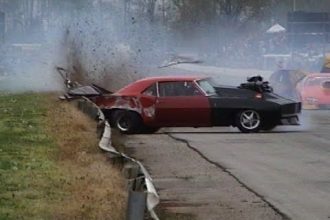 Watch Upclose Footage Of Two Camaros Crashing On The Dragway!